“Food for the soul” – an idiom that has found a greater meaning amidst the busy mundane schedules. A crave for contentment and that rare peace of mind make us seek refuge in activities that stir our inner being. It’s these pursuits that leave a lasting impression on the mind, and it’s these pages in memory that we tend to revisit and find relief in some later period of life. My visit to the mythological wonderland, Surendrapuri, is one such experience that I tend to reminisce about quite often, especially because of the story that goes behind creating this mesmerising spiritual treat. Surendrapuri became the answer to a father’s quest to build a structure in the memory of his late son. 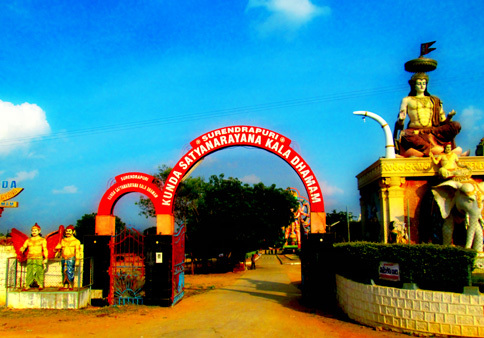 On losing Surendra Babu, his youngest son, Sri Kunda Satyanarayana began his relentless journey to create Surendrapuri, inside which he envisioned a vast mythological knowledgecenter, namely Kunda Satyanarayana Kala Dhamam. The hiccups were many, from finding a discouraging response from people he could rely on to facing the huge financial liabilities. However, he pushed ahead of every difficulty and took matters in his own hand. Thus, instead of involving a reluctant third party, he hired a few sculptors and made a slow but steady progress towards building the place where divinity prevailed. 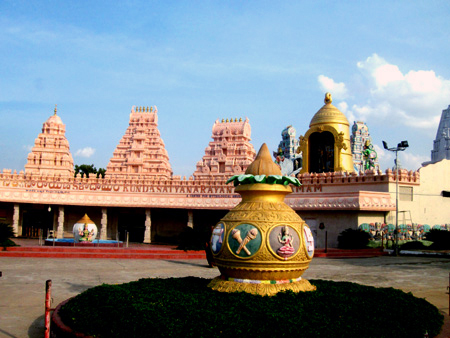 It is the only place where the deities from Brahmaloka, Vishnuloka, Sivaloka, Nagaloka, Indraloka, Yamaloka, Narakaloka, Patalaloka, Padmavyuham to Padmadweepam have all gathered in sync on earth. It was at the grey age of 70 that Sri Kunda Satyanarayana laid the final touch of completion, thus reiterating the simple yet hard fact that applies to every walk of life – Let go of the fear and the world becomes your next big project. It’s all in the willingness to strive hard to reach it, even if the goal seems to be a mirage. It was my first trip out of Hyderabad in the last one year, and nevertheless an unplanned one. On a Saturday morning, I was devoid of any plans and as the minutes passed, the itch to just go somewhere only multiplied. So, my option were to go to the old city and be a part of the hustle and bustle, or take a short trip to a near-by place. More than a day trip was beyond my reach as finding a temporary residence for my Lab in such a short notice isn’t easy. Being almost a regular participant in the rush around the Charminar area, I left the old city idea on the side and went on to find some useful advice in one of my WhatsApp group. There were quite a few suggestions, ranging from Ramoji Film City to various monuments that lay in the bosom of Hyderabad. I may have started for one of the palace but no sooner did I almost finalize that my phone buzzed with another suggestion – Surendrapuri, it said. I googled on the place and by 1 pm I began my sojourn to this mesmerising spiritual retreat that was almost 60 kilometers away. There was no chance to miss this structural beauty, which can be seen from almost 50 meters away. 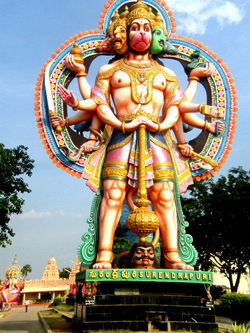 The entrance was a huge arch and as we enter through, we come face to face with almost a 25 feet tall statue of Hanuman with his Gada (or mace) resting on a devil’s head. While I was still trying to gauge the height, what caught my eye was a moving tail and out comes a baboon from behind the statue. It was then that I noticed that every corner is a chatting point of two or three baboons. It was amusing to see two of them playing tug of war with a plastic bag, while one was busy crushing Lays chips and eating the crumbled potato crisps. As I moved forward, the entrance immediately caught my attention. 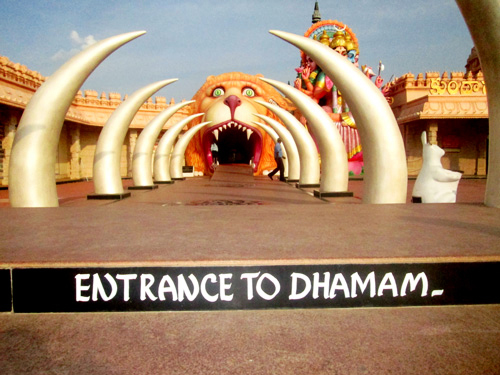 The pillars that resembled elephant tusks created the path to enter the dhamam through the mouth of a lion, while being blessed by the eight avatars of sati. The center is surrounded by trees and two vendors, one selling eatables, while the other is a little shop with various artifacts. But I couldn’t really stay back as by the time I looked at my watch it was already 4:30 pm, so I rushed to get my tickets at the counter, which closes sharp at 5 pm. And much to my disappointment, the camera and phone too were securely kept. The security is extremely strict, and there will be constant warnings even as you are about to enter. In fact, the lady who checked my bag took out every little item to ensure that no electronic or eatables are smuggled in. Well though thankfully I did surrender all my e-things, yet to my dismay I had to wait and gather a table full of paper and other items that normally lay undisturbed in my bag for months. As I stepped in, I could immediately relate to its popular connotation – “Mythology Awareness Center”. The various scenes of the Mahabharata, Ramayana, and the other scriptures were no mere words that are recited, each of them is elaborately depicted through statues. And to ensure that visitors are able to relate to the incidents, there are placates with the description of the act. The three hour journey on foot in the world of mythology is fascinating, but for someone who isn’t much active or with knee or joint problems it could be an ordeal. Also the fact that it’s an open roof display, makes it impertinent that we cover the entire center before the Sun goes down. 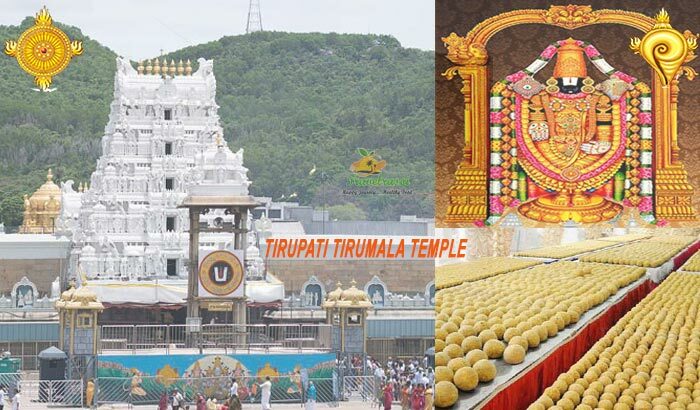 The best part of the center is not only does it bring in the deities of every holy place in India together under one roof (in this case – within a single plot of land), it also narrates the story behind most. The entrance begins with the narration of ” Bala Bharatam”, when King Pandu killed a sage couple by mistake and thus was cursed, which led to his childless state. It goes on to depict Kunti’s boons, which leads to the birth of the five Pandavas. 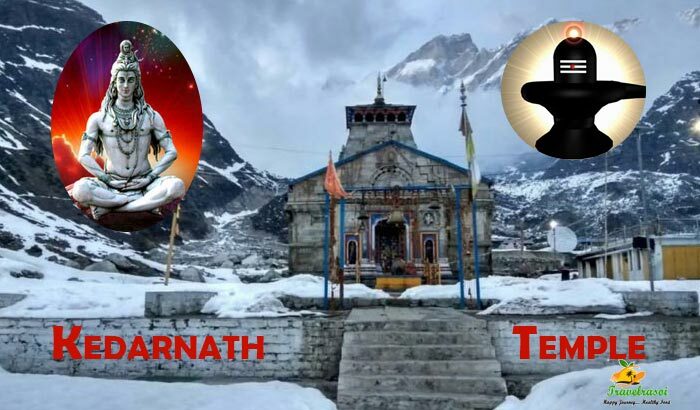 The entire structure covers the aspects of Mahabharata right from the time the Pandavas enter Hastinapura to the time of the Mahaprasthanika Parva, when the dog joins the Pandavas in their journey towards heaven only to die midway except for Yudhisthira who reaches Mount Sumeru. 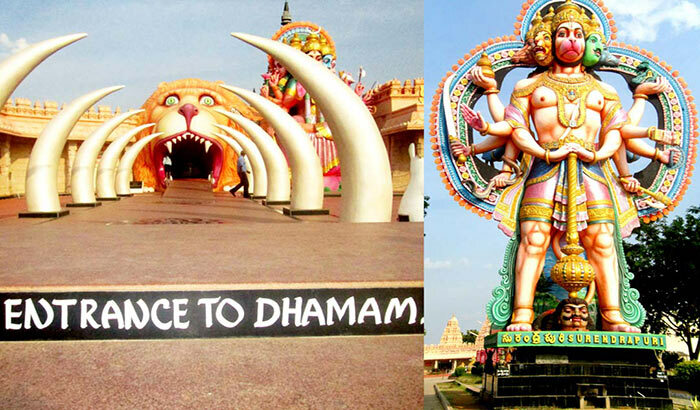 It also shows the various imageries of the Ramayana, which belongs to the genre of itihāsa like the Mahabharata. The definition of itihāsa has varied over time, with one definition being that itihāsa is a narrative of past events(purāvṛtta) which includes teachings on the goals of human life. 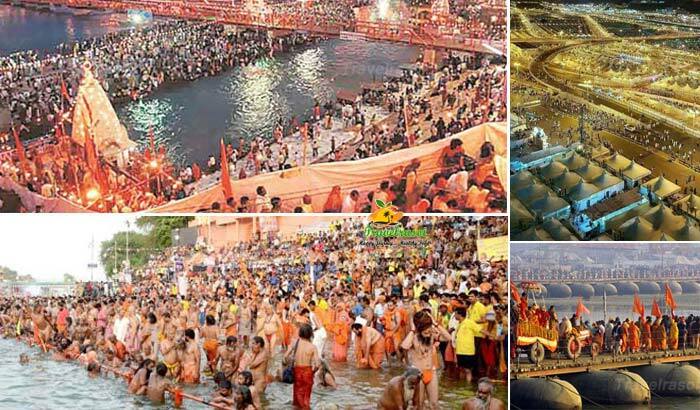 One of the most interesting spot that I was literally slipping towards is the replica of the Bank of Ganga. It’s the only place where shoes weren’t allowed. As you walk through knee-deep water, the entire length you will find beautiful temple replicas. Though it’s of a short length, it’s one of the highlights of this place. Some of the other significant depictions are Bal Krishna’s playful acts with the Gopikas or Krishna’s recitation of the scripture to Arjun. 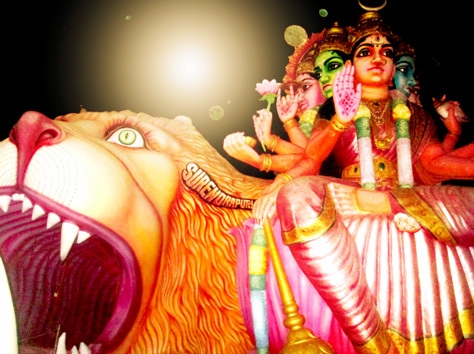 I could feel the essence of every place; be it the underground kingdom – Nagaloka, where you are welcomed by the Matsya Kanyas into the mythological life that stays underneath the sea level or the pride reflecting in the Snake King Vasuki’s face or the aura of strength despite the soft smile reflecting in his Queen’s face. It’s the sculptors whose hands had the talent to bring out such emotions in those statues, which are sometimes hard to find even among humans. While the positivity stretched beyond the golden gates leading to Vaikuntha, the abode of Lord Vishnu, or the cloud seats of the habitants of Indralok and Brahmalok, there were equally gruesome depiction of Narak or Hell, or while showcasing the numerous asur vadh (killing of the devils in different forms). You will also come across the story of Prince Siddhartha’s transformation to Lord Buddha and the 18 Sakti Peethas (the places where the various parts of Sati are said to have fallen) resulting in the birth of 18 holistic places. There are various resting points within the center. And as you reach halfway, you can satiate your hunger or thirst in the canteen with a very nominal priced Menu. Even inside the Canteen, the tea and coffee and milk point has a make belief cow from which the milk is used. It’s a nice airy place with slides for children to play. Food isn’t allowed but water bottles are. Inside the knowledge center you will also find vendors selling ice creams and beverages. And it was all people resorted to as we arrived at the Exit gate of the Dhamam. While my journey ended, but the Om chant that permeated every corner of the center stayed with me like a shield of peace providing me a serenity that even my tired body couldn’t take away. While it may not be a temple with lighted diyas and aggarbattis with pujaris engrossed in the divine rituals, the sublime spirituality is strongly felt. It’s a place where the scriptures find their voice and the people find their faith. Share the post "Surendrapuri: Where a Father’s dream come true and Mythology turns an adventure"
Its very well written; I lovbe what you have got to say. with it better. You have got an awful lot of text for only having 1 or two pictures. Thank you for your kind suggestions. We are always seeking to improve the look and feel of the blog so that people can actually connect with our content. If you have specific suggestions, feel free to get back to us at travelrasoi@gmail.com. We always like to hear from our readers. to say that this write-up very compelled me to try annd do it! Thank you for this lovely comment, you made our day. We always strive for making this site and its content more reader friendly, so that its worthy of our readers time.